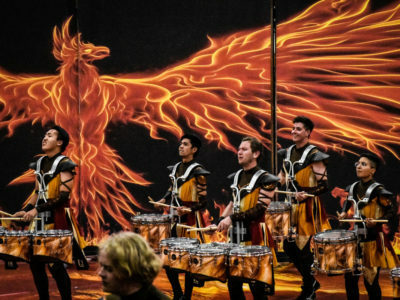 Drum Corps International, Bands of America, and WGI Sport of the Arts each have a Hall of Fame that honors influential contributors to their respective marching activities. How do the members get selected, and what does the honor entail? George Oliviero was teaching pre-calculus when his department chair interrupted his class, saying he was wanted on the phone. Oliviero had no idea at the time, but he had been selected for the Drum Corps International (DCI) Hall of Fame. “I got my notification between steps of a mathematical proof,” says Oliviero, who was inducted as a judge in 1992. When John Miller received a call to let him know that he would be inducted into the Bands of America Hall of Fame by Music for All (MFA), he thought it was a joke. 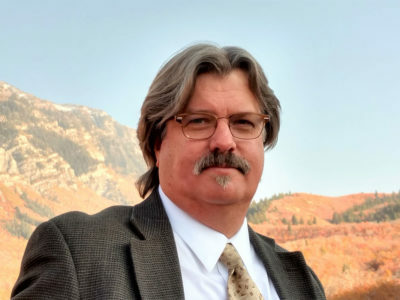 “When I realized [that the caller] was serious, my next thought was that they must really be scraping the bottom of the barrel,” says Miller, who was inducted in 2017 for his work as former band director at American Fork (Utah) High School. 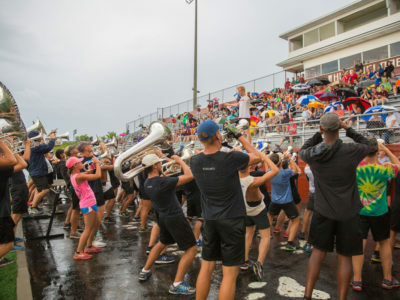 DCI, MFA, and WGI Sport of the Arts all honor those who’ve made significant contributions to the marching arts by enshrining them in their individual Halls of Fame. 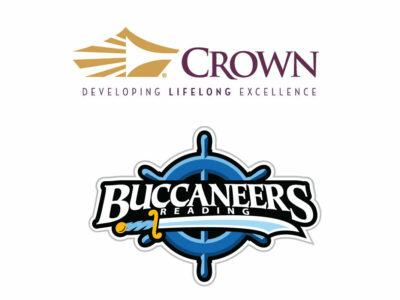 Each of these organizations have established their own criteria and processes for selecting their honorees. For all of them, the hall of fame selection process starts with a list of nominees. Sponsors can also solicit up to two letters of support from others on behalf of the nominee. 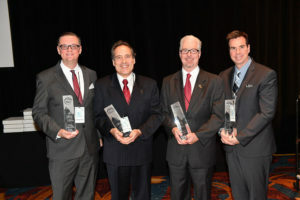 DCI’s Hall of Fame committee, which comprises six individuals chosen by the chair, examines the nomination and support letters, dividing the nominees into Legacy and Contemporary categories. 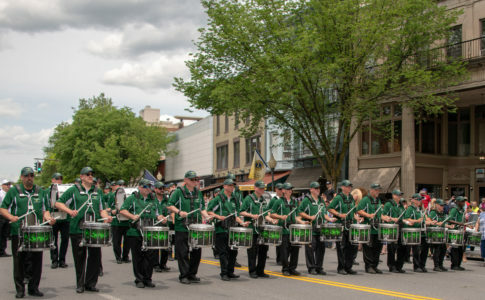 The committee submits a list of up to four nominees for the Legacy category and up to 10 nominees for the Contemporary category to DCI’s electorate, which includes all current members of the Hall of Fame and the directors of the World Class drum corps. The electorate votes for up to two in the Legacy category and up to five in the Contemporary category. Those nominees who receive at least 60 percent of the votes cast are inducted. 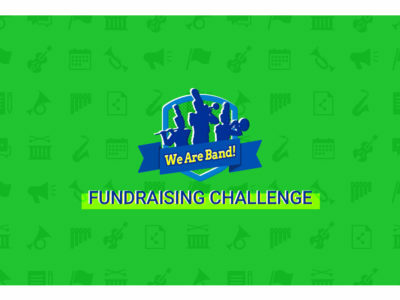 For the Bands of America Hall of Fame, nominees must have had a significant influence on Bands of America, music education, and the nation’s band activity; represent impeccable character, ethics, and professionalism; and be a role model for music education professionals. 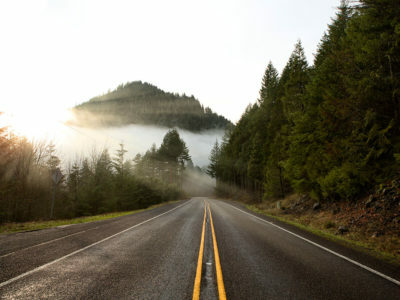 The individual sponsoring the nominee submits a letter detailing his or her qualifications based on BOA’s criteria along with three supporting letters to BOA’s senior educational consultant. The Hall of Fame committee then reviews the list of qualifying nominees and selects the inductees, who are then ratified by the Music for All Board of Directors. The BOA Hall of Fame inducts two to four individuals each year, but these numbers can vary. 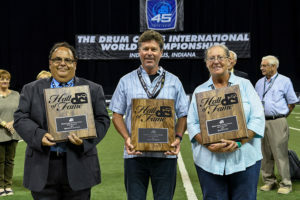 The WGI Hall of Fame recognizes individuals who have significantly contributed to the standards and direction of WGI in the color guard and percussion activities. Currently, individuals in the winds division are not honored but will eventually be included. 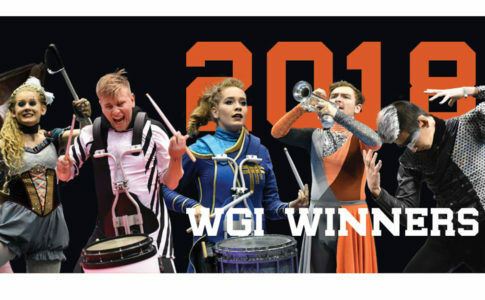 “Selection to the WGI Hall of Fame can be achieved as a designer, a director or [a person in] other administrative position, an adjudicator or [someone] in adjudication leadership, from amongst WGI employees, or as a volunteer,” says Ed Devlin, president of the WGI Board of Directors. 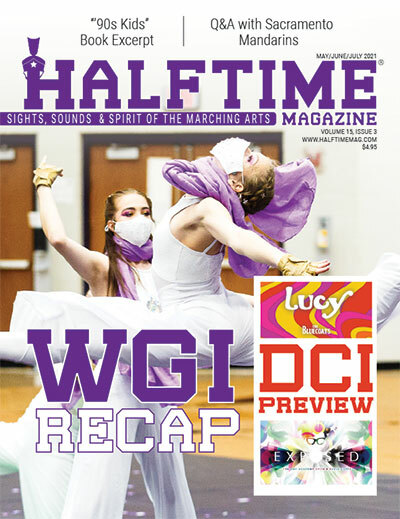 WGI evaluates its Hall of Fame nominees based on 14 criteria. Among these are meritorious contributions, influence on WGI, depth of service, length of service, program success, support of WGI educational programs and committees, and service to advisory boards. The nomination process is open to anyone who has identified an individual deserving to be inducted into WGI’s Hall of Fame. Sponsors of nominees submit a nomination letter and three letters of support. “The voting is completed by Hall of Fame members and the WGI Board of Directors,” Devlin says. WGI inducts up to three individuals to its Hall of Fame each year. After inductees have been selected, all three organizations honor them in their own unique form of ceremony. In addition, the inductees are invited on the field on Friday night after quarterfinals when they are given plaques that indicate their induction. The BOA Hall of Fame induction ceremony is held annually as part of the Music for All National Festival, presented by Yamaha, in March. 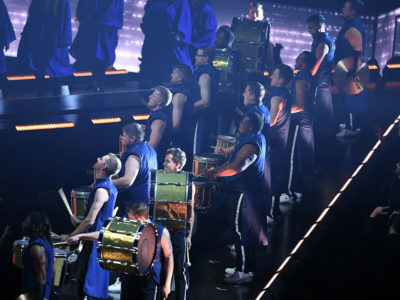 “Hall of Fame members are inducted during a ceremony at the Gala Awards Banquet that culminates the festival with over 3,000 guests,” says Deborah Laferty Asbill, vice president of marketing and communications at Music for All. WGI honors its Hall of Fame inductees on the Wednesday night before its World Championships. Neil Larrivee, who was a member of WGI’s induction class of 2016, says he was humbled by the honor but knew he could not have achieved it by himself. “These awards are given to one person, but no one in our activity succeeds alone,” says Larrivee, who is currently vice president of education and drumstick product development at Zildjian and Vic Firth. During his acceptance speech, Larrivee made a point to thank the many people who had been part of his past ensembles at Dartmouth (Massachusetts) High School and King Philip Regional High School in Wrentham, Massachusetts, especially the students he felt fortunate to teach. “I have enjoyed thanking the many who have been part of it all,” Larrivee says. 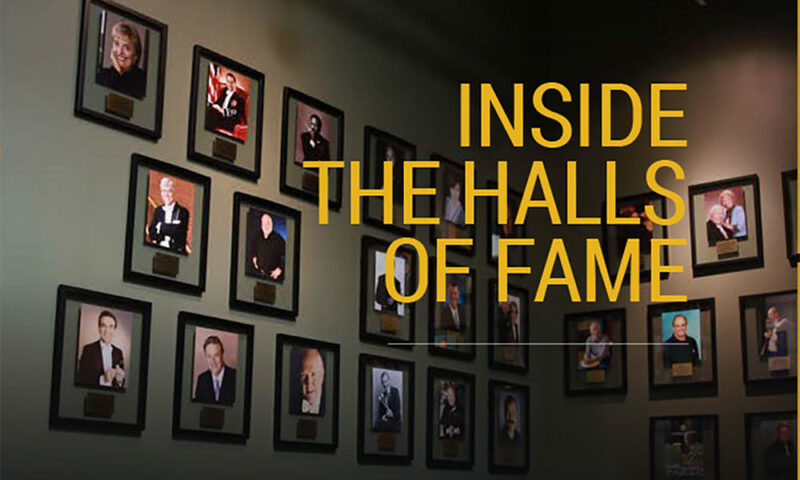 Music for All further honors its Hall of Fame members at its headquarters office in Indianapolis with walls of photos and plaques that highlight their career accomplishments. Neither DCI nor WGI have physical locations for their Halls of Fame. 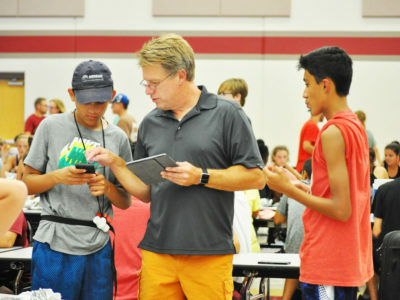 Each DCI inductee has his or her picture taken, and those photos are archived. It’s been 26 years since Oliviero was inducted into DCI’s Hall of Fame. Looking back he’s in awe of those individuals with whom he shares the honor. “My mind sees waves of memories, of our youth, of those early days of DCI, and I see a continuing love for the activity,” he says. Congratulations to the most recent Hall of Fame inductees. Featured photo courtesy of Music for All. 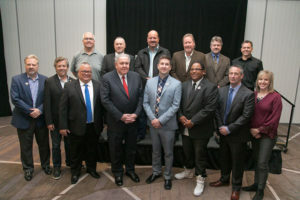 Photo 1—Joining the Club: New and past WGI Hall of Fame members gather together after the 2018 induction ceremony. 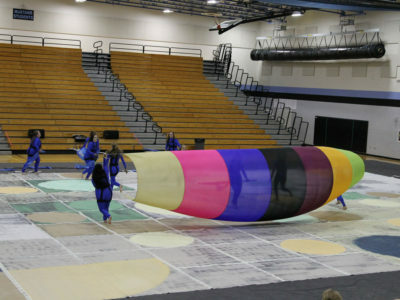 Photo courtesy of WGI Sport of the Arts. Photo 2—Grand Gala: New Bands of America Hall of Fame members—Dean Westman, Matt James, Randy Greenwell, and Kevin Ford—celebrate their achievement. 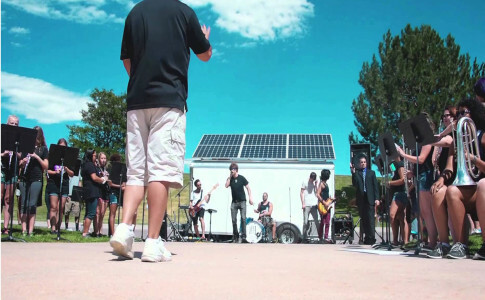 Photo courtesy of Music for All. Photo 3—Field Day: Bruno Zuccala, Paul Rennick, and TJ Doucette are recognized as new Hall of Fame members during the 2017 Drum Corps International World Championship. 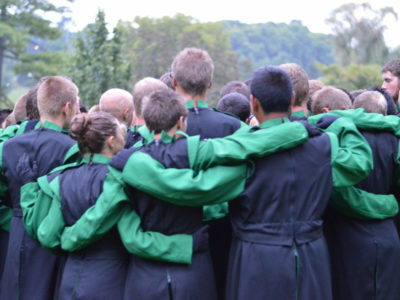 Photo courtesy of Drum Corps International.